Write and take covert photos at the same time! Deciding which spy pen is the best really depends on its primary purpose. 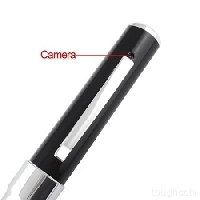 The most common type of spy pen is the camera spy pen, which cleverly conceals a camera somewhere on the pen's construction. However, this is not the only type of spy pen; there are spy pens that can be used for coding/decoding secret messages, pens containing invisible ink, flashlight pens, pens that can be used to charge other essential spy gadgets and even pens that can give potential users a nasty shock! The best spy pen in this category is the Ultraviolet Invisible Ink Spy Pen. With this crafty gadget the potential spy can write secret messages on paper that to the naked eye looks blank. However, the ultraviolet invisible ink spy pen also contains a UV light, enabling the user to read the hidden messages! Buy two of these and you can send secret messages all day to a friend. Again utilizing invisible ink, the best coder/decoder pen is also multi-purpose! The Confidential 5-in-1 Pen also contains a magnifier, a stamper for stamping "Top Secret" on your messages, and a small hidden compartment for stowing away classified documents. Along with the invisible ink and decoder marker, that's five handy fun uses in one great pen. When you think of weaponized spy pens, you no doubt think of James Bond films where 007 has a handy pen that shoots lasers, squirts acid, or fires poison darts. These items are for fictional assassins only; the real potential spy will have to settle for a Shocking Pen. This innocuous looking device, if used by someone who is unaware of its hidden surprise, will emit an electric shock when the side button is pressed! This pen also has a flashlight incorporated into it, making it a shockingly useful item. If delivering electric shocks to people who unwittingly use your spy pen is likely to leave you in a world of trouble, then it might be best to play safe when choosing your spy pen and its particular functions. An incredibly useful spy pen is the Pen Charger. This ballpoint pen offers various connectors, so it can be plugged into a smartphone or tablet and then deliver a charge to your electrical item, ideal for sending an emergency call when your cell phone is out of juice! With its USB plug, this pen can be used on computers too. There is a wide choice of spy pens in this category. Covert filming and photography is an essential part of being a professional spy. You might want to start off with a Pen Camcorder 4G which hides a fully functioning camcorder spy camera inside its body! With 80 minutes of video-recording time, this is the spy pen for those who need to record suspicious activity. However, if you really want to impress your fellow spies then you need to consider investing in an 8GB HD Spy Video&Audio Camera Pen. This Rolls-Royce of spy pens can capture still images, video and sound, and it can also time/date stamp any data it records. The pen has 8GB of memory which means it can store up to 20,000 jpeg images or an incredible 5 hours of AVI video. With this pen a spy can truly feel prepared for a good day of clandestine snooping! This guide should make choosing which spy pen is the best an easier mission for the potential spy. Do you want to write secret messages, charge your tablet, make video recordings or shock your foes? All of the mentioned spy pens have their individual merits, but it is hard to beat the 8GB HD Spy Video&Audio Camera Pen. This magnificent spy pen's camera is hidden above the pocket clip, so it can be carried in a pocket and still record your surroundings. It has a motion-activated image sensor (2 MP), a lithium battery that provides two hours of power before it needs charging, and it can be used as a regular pen for writing! Even 007 would be impressed with that.